Erin Pavy from Ainslie Chemmart Compounding Pharmacy has won the prestigious national Pharmacy Guild of Australia/Guild Super Pharmacy Assistant of the Year Award and is the first- ever ACT winner to do so. Erin was selected from a strong field of more than 450 nominations. Her success as best national pharmacy assistant reflects Erin’s commitment to a career in community pharmacy which spans more than 20 years. She began her pharmacy career as a junior pharmacy assistant in the front of shop but like so many pharmacy assistants, Erin was committed to progressing her career in health care by gaining as much product and health condition knowledge as possible so that she “Highly trained, passionate and dedicated to the thousands of visitors to community pharmacies daily, pharmacy assistants are often the first person that a patient will talk to when they enter the pharmacy.” could best assist the pharmacy’s customers. Erin paid tribute to Colette Needham, the proprietor of Ainslie pharmacy saying that she was very lucky to be employed by pharmacy owners who invested a lot of time in her training and mentored her throughout her career. “We spend a lot of time finding good courses and events, and we send our staff to a great deal of training which pays dividends for the pharmacy,” Colette said. “Your people must be passionate about their job and they must have vision,” she said. Congratulating Erin on her win, Margaret Beerworth, ACT Branch Director of the Pharmacy Guild of Australia said pharmacy assistants were often the unsung heroes of the health care sector in Australia. “Highly trained, passionate and dedicated to the thousands of visitors to community pharmacies daily, pharmacy assistants are often the first person that a patient will talk to when they enter the pharmacy,” Margaret said. “As first-line community relations experts, pharmacy assistants have a very strong link to their local communities and are able to advise pharmacists and other staff about local concerns and emerging issues. The ability to recognise when a patient needs to be escalated to the pharmacist is an important part of a pharmacy assistant’s training and ongoing courses and continuing professional education ensure they keep abreast of the latest developments in the health field. This is particularly evident when As first-line community relations experts, pharmacy assistants have a very strong link to their local communities and are able to advise pharmacists and other staff about local concerns and emerging issues. the patients are in pain and often want nothing more than immediate relief. The pharmacist may not be available immediately as they may be counselling another patient or attending to scripts so the pharmacy assistant can organise to get a script into the system and begin the questioning process which may be required to provide as much information necessary to the pharmacist when they are available. This duty of care to the patient is a fundamental principle underlying all the work that pharmacy assistants undertake. Combined with their empathy and knowledge, pharmacy assistants help to ensure that a patient’s experience in a community pharmacy is positive and helpful. 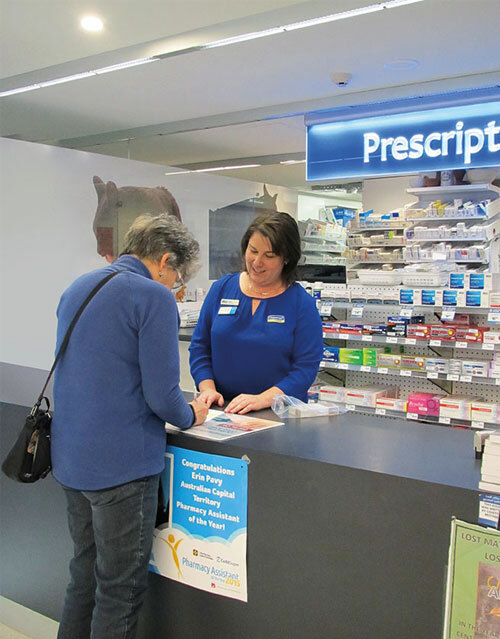 “We are so proud to have the best pharmacy assistant in Asutralia right here in the ACT,” Margaret said.